Large reddish purple leaves are thick, glossy and add excellent color to salads. Harvest regularly and sparingly for greens. 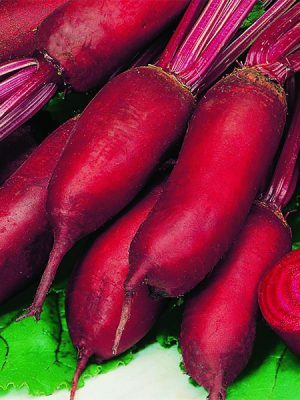 We found in a year where leaf miners destroyed the beet greens of many other varieties, they left Bull's Blood alone. Flattened globe-shaped roots with good quality and flavor.